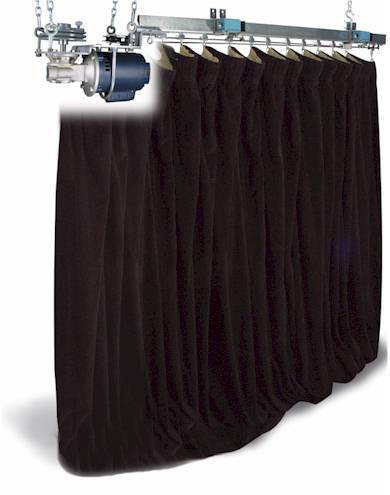 Specifically designed for projects requiring the curtain machine to be located off of the finished floor. These machines are designed to attach to, and align with, the curtain track and be supported by an overhead structure via eye-bolts (ceiling brackets for direct to ceiling mount) mounted to the machine's base. The machine eliminates the vertical operating cables that normally run from a floor mounted machine to the track live-end pulley. The control box for this model machine is connected by 6' of BX cable to the machine. Control is stop/start/reverse from any point of travel. Models are ordered according to the model track they attach to: 2928 for Model 280 Series Silent® Steel, 2917 for Model 170 Series Besteel®, 2950 for Model 500 Patriarc® and Model 2914 for Model 140 Rig-I-Flex®. Double machined N-grooves in conjunction with an adjustable tension idler provides maximum friction for a near slip free operation. Track mounted limit switches are used to provide positive stops for the curtain. Two limits are provided with the machine; one for the open direction and one for the close direction. Limit switch voltage is 24 VAC. Master carrier with tripping dog included. Control box, supplied attached to but separate from the machine for placement on an adjacent wall. Control box is supplied pre-wired and to machine with 6' of BX cable. Curtain machine shall be fully automatic type equipped with a 1/2 HP fixed speed AC motor directly driving a right-angle gear reduction unit, on the output shaft of which shall be mounted a dual N-grooved drive wheel. Cable tension shall be provided by an integral adjustable tension pulley. Drive wheel shall deliver a fixed cable speed of 90 feet per minute. Mechanism shall include magnetic contactor to provide reversing action at any point along the travel and shall include three-button control switches, one mounted on the machine's control box and one for use as a remote control. Control switch wiring shall be accomplished through a low voltage system running from the machine control box to the remote control switch station. Track mounted limit switches shall provide stop signals to machine for full open and full close positions. Machine shall be equipped with disconnect switch, overload protective circuit breaker and control protective circuit breaker. The entire machine shall be mounted on a heavy steel base designed to be attached to end of curtain track and supported from the building structure. Model 2928, 2950, 2917 & 2914 as manufactured by Automatic Devices Company of Allentown, PA.